Top Ten Posts On Your Blog That Would Give The BEST Picture of YOU (as a reader and a person -- so pick the 10 best reviews/posts that you wish every potential reader of your blog would see!) Here we go! 1. My review of Tahereh Mafi's Shatter Me. Post here. 2. My review of Julie Kagawa's The Iron Knight. Post here. 3. My review of Amanda Grace's But I Love Him. Post here. 4. My review of Lauren Myracle's Shine. Post here. 5. My review of Elizabeth Scott's Between Here and Forever. Post here. 6. My review of Jennifer Echols' Such a Rush. Post here. 7. My review of Katie McGarry's Pushing the Limits. Post here. 8. My review of Wendy Higgins' Sweet Evil. Post here. 9. Gotta Have It YA Releases monthly post. Example here. 10. 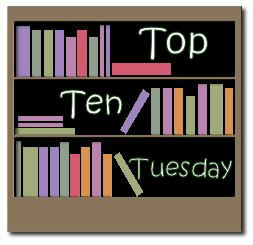 One of my posts for Top Ten Tuesday which will let you get to know me a bit. Post here. This was a fun TTT! Leave a comment and share yours! I'm curious to read your review of The Iron Knight! It's on my TBR list! Milda, oooh, rush out and read that series... especially The Iron Knight, as it was the final and best book in the series.